A duck out of water. 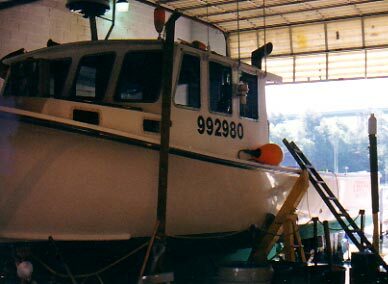 The 'Chrissy D.' in for maintenance. The boat was positioned over the trolley while in the water and then hauled up on the steel tracks. 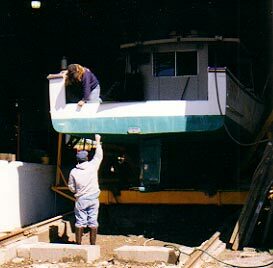 Annual maintenance consists of repairs to the hull, engine, bearings, fittings, bilge pumps, electrics, plumbing, electronics, safety gear, paint, rails, glass, decking, prop...you name it...if it's busted, it gets fixed. Needless to say, this can run into some big buck$, but it has to be done. Good maintenance can make the difference between getting back home or ending up on the bottom. At sea in cold Atlantic waters, the boat is life. 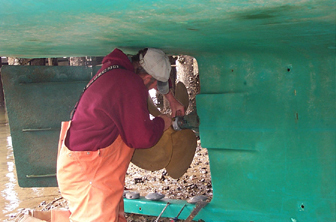 Why paint a fiberglass hull? It's not just for cosmetic reasons. The paint contains copper which discourages the growth of marine organisms (algae, barnacles, etc.) on the hull. The U.S.S. Constitution has a copper-clad hull, originally flayed on by none other than Paul Revere (or more accurately, as was pointed out by a reader, by one of the many companies he owned). 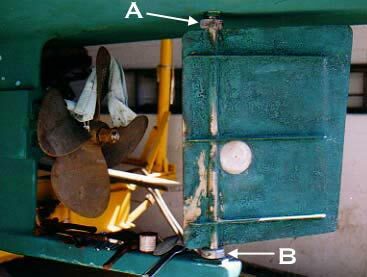 What keeps the metal parts that are constantly under water from corroding? Seawater is essentially a solution of salts, and as such, it is an electrolyte. When metals are placed in this solution, electrochemical reactions occur that cause them to corrode. In general, more electronegative metals corrode faster than more electropositive metals. It is possible to protect an alloy (steel) from corrosion by placing it in contact (either directly or via a conductive wire) with a more electronegative conductor (zinc). Zinc electrodes (A and B) prevent the metal parts they contact from corroding in seawater. Electrode A is about 3 months old and displays the pitting that occurs. Electrode B is new. (That's a 28" prop). Two more 'zincs'. 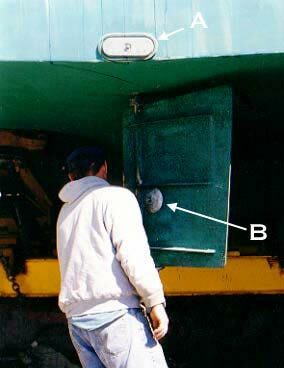 'B' is to protect the rudder. 'A' is wired to the drive shaft housing and other exposed metal parts. While in the water the keel is flooded with water from the prop to just behind the transducer. 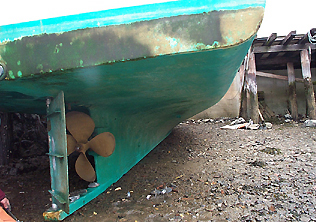 This gives the boat more stability and helps cool the drive shaft. A view along the starboard side shows scratches and gouges made by traps as they were hauled up. 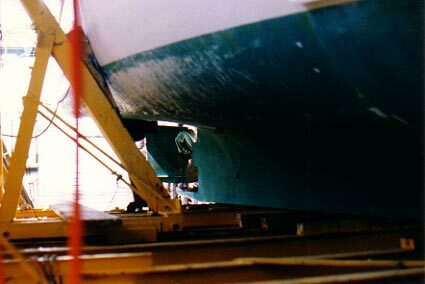 This area of the hull has an extra thick layer of fiberglass for this reason. The area will be repaired and painted. Sometimes you don't want to be messing around with a haul out when Mother Nature can give you a hand. 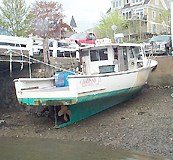 For minor maintenance, it's usually easier (and cheaper) to just tie the boat up in shallow water while the tide is in and let her strand at low tide. You can really only do this during a spring tide. Enough of the bottom is exposed so it can be inspected, cleaned, and the zincs replaced. 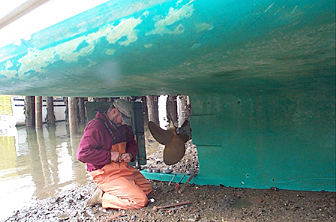 Cap replaces the zincs on the prop shaft and rudder and cleans the bottom of algae and barnacles. You can't see it in the photo, but there were signs of cavitation on the prop. Props are finicky things. The slightest misalignment or imperfection can ruin efficiency, cause vibrations, and waste fuel. Typically they're made of bronze.